The Port Maitland, Festival of History Continues to Grow! It sometimes is hard to express the regret we may have for not being exposed to more local history while in school without blaming our teachers for that omission. Please understand we may not know who was at fault, but it was not you! It also seems every year as I prepare my article in advance of the Port Maitland, Festival of History, I fall back on the same old theme. This being; what we missed and how we regret not learning more about local history! Maybe this void is the Spirit who drives us to put in the many hours throughout the year preceding the festival, finding participants and sponsors and dealing with all the details required to put on such a show. Whatever the reason, the result is a festival which tells much of our local history. This year, in addition to the one-hundred and twenty volunteers who will man/woman the fifty-five displays, it will take forty plus volunteers to put on the festival. In 1994, I purchased a couple postcards, one showing the Ellis Hotel at Port Maitland, and the other depicting the Ellis Hotel in a street scene, also at Port Maitland. I knew it was no Port Maitland I had ever seen, but what the heck, I was not that old and maybe Port Maitland looked like this during its hay days of tourism! The cards were shown to my late friend, Earl Siddall who pondered them for a considerable time and said, "Not here!" After some discussion, we concluded it must be another Port Maitland. But where! There is a Dunnville, in Newfoundland. There are rivers named the Grand, flowing into nearly every large waterway on the continent, but where is there another Port Maitland? Finally, one of us, I do not recall who, said "How about Nova Scotia?" Out came the atlas and whalla, Port Maitland Nova Scotia! 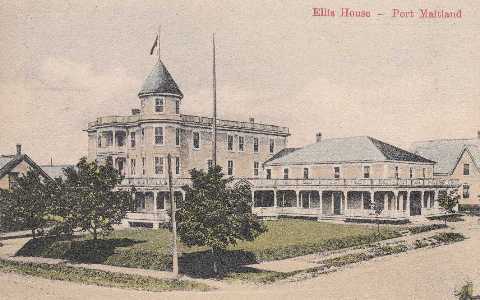 I gave Earl a scanned copy of the Ellis Hotel card. He had a lot of fun with a now former Port Maitland fellow whom shall remain nameless, explaining to him where exactly the Ellis Hotel once stood in Port Maitland ONTARIO. He told great stories about its owners and of the many functions which took place there. Earl went to his grave sticking to this misrepresentation, never telling the gentleman the real story! In September 1996, my wife and I took a trip to Maine, in an attempt to locate long lost relatives. We failed, but we continued up the east coast and on to Nova Scotia, until we reached Yarmouth. Before taking the ferry back to Bar Harbor Maine, we made the short trip to Port Maitland. There we met a fellow by the name of Craig Crocker a local history nut and the manager of the Port Maitland, Co-op Lobster Company. Craig showed us where the Ellis Hotel once really did stand and then told us how Port Maitland had once been a thriving tourist and fishing village, where tourists came from far and wide to visit the port with its large fishing fleet. Sounded much like Port Maitland Ontario! Maitland was the terminus for many a large passenger ship that ran regular excursions into and out of the Port. We also never learned about the flight training school at the Dunnville Airport during WWII, nor did we learn there were many other similar airport and army camps located throughout our area. We never learned that for years the famous Bohemian Sketch Club of Buffalo, spent their summers at Port, and how under their leadership they formed The Art Students League of Buffalo. Each summer for nearly thirty years a new generation of aspiring artists came to Port Maitland to discover the inspirations and skills required of great painters. Their annual pilgrimage began as early as 1892, and lasted into the teen years of the 20th century, producing thousands of local sketches. Few can be found today! As with many rural communities, families who arrived early stayed late, and married into each other’s households. Our community has a rich history of local families. When family information is charted we find the reason for the expression offered to visitors and new corners alike in smaller communities: "Watch what you say about people in this town. Everyone is related to someone else!" Times have changed. Family members now move away more then in the past. Still, it remains surprising the connections remaining between area families. Today we are connected through common great, great, great grandparents, as apposed to grandparents as in the past! On Saturday July 24th, from 10:00 a.m., to 4:00 p.m., the Fourth Port Maitland, Festival of History Entrance to the Grand, will be held at the Dunnville Airport. As they did last year the, RCAF # 6 Dunnville Inc. have opened their hanger and their museum to us. We have grown from thirty-five displays in 2003, to fifty-five this year. In addition, this year, the Niagara Skydive Centre, has donated a portion of their facility for our use. The tarmac will also be put to good use displaying a number of outdoor exhibits. With fifty-five displays, it is not possible to name all the exhibitors, but I will attempt to give you an overview. We have the Canadian Baseball Hall of Fame, and of course my good friend Pig-Skin-Pete from the Hamilton Tiger-Cats will be back. Someday I must tell you Paul's real name! Whoops! A number of area funeral directors will display their antique hearses, while local antique boat owners and restorers will display their crafts . Genealogy displays will play a major part in the festival, as will local postcard collectors who have documented much of our history in their collections. Antique decoys, quilts, bottles and photographs will be displayed, as will fire equipment and historic displays for a number of local churches. This year we have for our first time, a display depicting black history. We will also be joined by a prominent writer on that subject. The Boy Scouts have not been forgotten, nor have the O.P.P. You will find numerous authors of local history books, most making their books available for sale, but more importantly they are there just to talk with you. To this day, the debate goes on among those interested in these things as to when the Feeder Canal was last used and for what purpose. Recently, I became interested in the restoration of the Port Maitland Lock, an original lock from the second Welland Canal. This lock was built, to allow ship traffic to travel up and down the Grand River past Dunnville, as well as to provide the first direct connection to Lake Erie for the Welland Canal. You will have the opportunity to learn more about it, as well as the Mohawk Island, for which there is also restoration movement afoot. These two engineering achievements are connected, as they were both built by the same engineer, John Brown. The stone for both projects came from the Queenston quarry. On a bit of a side note, a number of lighthouses on Lake Huron were also built by John Brown. Representing one of John Brown's lighthouses at Southampton, is the Chantry Island Lighthouse Institutes display. It is hard to think of any historic interest which is not being displayed. We will have a couple local artists, both prepared to demonstrate not only their artwork, but the process they follow as they form their thoughts and visions into a medium we can understand and enjoy. Genealogy, cannot be considered in the Niagara Peninsula without taking a good look at the possible connection our family may have with the United Empire Loyalist. The U.E.L. will be well represented. Their displays are a must see, if you are serious about learning your families U.E.L. history. At the opposite end of the spectrum is the subject of ones loyalty to the United States. During the American Civil War, many young Canadian men joined-up and served in the States. Check out the Civil War display and find out why! This year, in addition to displays of antique fishing equipment, we will also have for the first time, a few current fishermen/women demonstrating their expertise of making and repairing gill nets. Talk to the fishermen about their profession, but be wary! I have never met a fisherman yet, unwilling to talk, or who does not love to pull ones leg or tell a long and tall tale, to friend or foe! Maritime history is the history of Port Maitland. Agricultural history is the history of Dunn and Sherbrooke Townships. Admittedly, we have not yet gathered the number of agriculture displays we would like to see. Maybe you will visit us and take back good reports to some of your agricultural historian friends, and next year they may join us. We have done a good job, putting together social history displays, as well as maritime displays, be they of the Welland Canal, the Feeder Canal, lighthouses or commercial fishing. We have touched on taking care of our dead, while at the same time preserving their memories. We have reminded ourselves of our differing faiths. We have taken time to recognize the labour and skills required by our ancestors to eke out a living. Come see what the spirit name Regret has put together for the 4th annual Port Maitland, Festival of History. Admission is by donation. 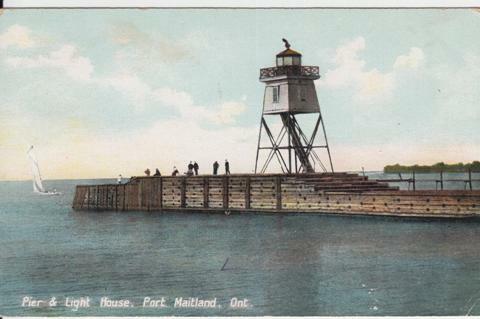 The Port Maitland Festival of History support a number of local history projects, including the Port Maitland Lock restoration, the Mohawk Island lighthouse restoration. Pets are better left at home, as we have no facilities to care for them and they will be happier not be trodden on by hundreds of big feet. Food and drink is available, as is adequate parking. The local Air Cadets will assist you with your parking, so you might save a twonie or two to drop into their donation can as you leave the parking lot (Yes spelled twonie!). Coming from Dunnville, cross the river to Byng, then head for Port Maitland, by turning at the Avondale/ESSO Station. The airport is about three kilometers from the village of Byng. Enter at the main gate. You will see a hanger to your left with a large sign telling you, you are approaching the RCAF # 6 hanger. We'll be there!